It might be considered blasphemous in the travel blogging community, and among the propagators of solo and full time travel, to admit to not all (my) gladdest moments being travel related. But I shall be quick to add, that while the anticipation of a departure into lands unknown does not quite measure up to gazing upon the face of my newborn or the heart-swelling pleasure of a trusting grandchild’s hand in mine….it does come close. What are your gladdest moments? There is a unique and different gladness in each of those scenarios you mention! A departure into unknown lands brings a pleasure that is more delight and anticipation, while the love of family and even the general theme of “home” is a pleasure that is more one of contentment and a happiness born of love and attachment. Splitting hairs on that definition of gladness, I admit, but I’ve recently been ruminating on an attachment to home things and people that exists in tandem with a deep-seated urge to roam, and I’ve decided I absolutely need both of these things to feel truly glad. Pretty much the same as yours Madhu and I might add creating something beautiful. With your talent for craft I am not surprised Gilly. I too have derived great joy from my design projects. Ha, you can have as many gladdests as you please Meg…who cares about grammer! Your great niece sounds like a girl after my own heart, only wiser and more focused 🙂 Spanish visa hassles have my travel anticipation just as gut-unsettled at the moment. I am this close to swapping with someplace more welcoming. Not yet filed!!! Hoping the applications will be accepted today. We are scheduled to depart on Aug 11! 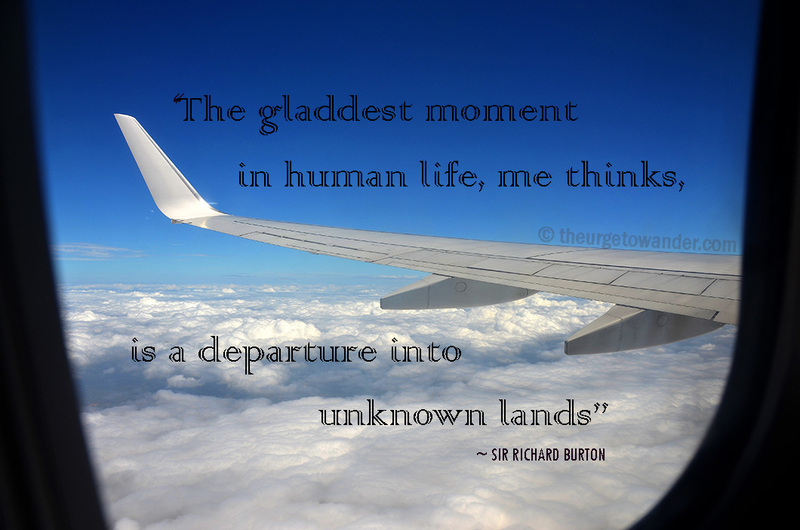 Mine also rings true with travel to unknown and even known yet can never get enough of places, as well as spending time with my two little special people in my life. Which is why I am going to do both of these in the comcoming year, travel with my kids:) I love the anticipation and planing phase for my travels. I think I am also gladest when I have my heart on a challenge. Like starting a charity in Sri Lanka while traveling long-term as a solo parent with my kids. Yeah I can never settle for one moment, if I keep going some more will pop up, so I will stop here:) Great post to get us thinking Madhu! Doing both is the way to go Shani! Good also that you are having trouble shortlisting from your list of gladdests 🙂 Good luck with that charity and the solo travel with your kids. In the time of Internet and social media there is no such thing as ‘unknown destination’. A traveler has the means to check on a destination before setting foot on land. Hence the pleasure of traveling to ‘unknown destinations is mitigated. The pleasure is in human and cultural connectivity. You are right, the internet has diminished the anticipation of the unknown somewhat, but I have rarely felt less excited or let down because of it. Pleasure to see you here Indra. Thank you for stopping by. Wonderful question to pose! You’ve got us all smiling again thinking back on our gladest moments. Many, indeed, are those special times far from home. And then there are the ones most close to our hearts. Hi Stephen, happy to have got you smiling 🙂 I so regret not having enough time to catch up with all my virtual friends. Grateful to you for staying in touch. Your blogs are always a pleasure. Some of my gladdest moments have come from travel, friends and family but also from impromptu acts of kindness toward someone in need. I love travel, but always, my absolute favourite part of travel is when I see that Sydney Harbour Bridge from the sky and know in just an hour or so I’ll be back with my family an friends again. I adore exploring this big beautiful world, but for me, there is no place like home. My gladdest moments is: when I am touring Himalayas. I can imagine how exhilarating that must be Tushar! I am yet to set eyes on the mighty Himalayas, but I have a feeling they might very well top my list if/when I do manage to get there. It’s among my most happiest moments, yet being grateful for being blesses to do so. It seems to me that my gladdest moment was yesterday afternoon, sitting on my balcony and watching a breeze blow through the trees nearby. Shimon, you underscore the importance of living in the moment and appreciating the small things in life….always! Thank you very much for the reminder. I agree. Although an empty nest erodes the contentment somewhat and brings on the itch to travel more frequently 🙂 Thank you for spending time on my blog and for all the likes and comments Ken. Much appreciated. Outside of family, my gladdest moments are when I’m creating and everything is clicking – the runner endorphin rush hits. I think our gladdest moments might feel different, each one a different swelling of the heart and lifting of the soul. My grandchildren being born felt much different than my jetting off to a new place. My discovery of a new small out of the way and beautiful little hidden jewel in my travels felt much different than my discovery I could be joyous on my own. For gladdest moments- I’m with you on seeing the face of your newborn and the feel of the grandchild’s hand. The travel to unknown parts can be exhilarating but I’m always glad to be back home, reunited with my familiar bed. At this time I would like to mention a quote from the movie “The secret life of Walter Mitty”: To see the world, things dangerous to come to, to see behind walls, draw closer, to find each other, and to feel. That is the purpose of life. My gladdest moment today was when I asked Chevvy [my dog] for a kiss, and she gave it unquestionably. Each day has one of those moments. I think I agree…because this also includes reading new books and meeting new people and…well, I agree.